Hello, it’s me, the self-described worst guest in the world! And I’ve just had a long time friendship end over it. But this isn’t just the story of that loss or how I’ve come to expect the worst. As a recent convert, I’ve blogged before about how I’ve been inappropriate countless times at the Shabbos table because of social norms and cultural codes that I couldn’t seem to wrap my pretty little head around. Homosexuality was too controversial for the table but discussion about the state of my ovaries was not. Talking about my fractured family was too intense but exchanging pleasantries about shopping sprees was not. I made myself a nice little chart of do’s and don’ts for the Shabbos table after one particularly memorable meal. But even with my helpful chart, I realized long ago that, for me, the Shabbos table is never a peaceful place. It’s a rollercoaster ride. I never know when to expect the next twist or turn. I never know when I’m going to be expected to swallow the latest racist remark or terrifying Ashkenazi dish. I’m never sure if I’m using the right fork. After all, it was only yesterday that I mistakenly stole my friend’s soup spoon at a wedding and then had to fight the urge to turn all shades of purple when she pointed this out. It seems the “conversion process” is never-ending. And the ensuing period of cultural integration has left me with an overwhelming sense of foreboding. In the pit of my stomach is always that feeling that I’m doing things wrong or saying the wrong thing. My friends watch from the sidelines and coo over my mistakes. Some think watching me stumble over the bumps is incredibly amusing in a voyeuristic way. I’m frequently dubbed “funny” even when I’m not trying to be. I’m told I’m brave for frequently saying what no one else says when really, I don’t realize WHY no one else was saying it. I’ve been Jewish two and a half years and still, I find myself asking my friends for advice in navigating the rough waters of cultural faux pas. At a recent wedding, I probed my friends with questions like: Do you have to send a thank you card to everyone after a Shabbos meal? Do people do Chanukah cards? And if I make such and such statement, is it racist? I got straight answers for only the first questions. The latter just made people laugh. And I wondered later if they were laughing with me or at me. There are memories that still make me cringe. There is the time, early in the conversion process, where I tried to shake a rabbi’s hand. He demurred kindly. There is the time that in a burst of exuberance after hearing a friend’s good news, I bought her a Target gift certificate for use on baby stuff. Another friend gently pointed out that the cultural norm is to wait until after the baby is born to buy gifts. There is even the time that I tried to get my husband to put on a big turkey dinner ala Thanksgiving for the first day of Chanukah like my family used to do for Christmas. He just stared at me blankly. I told one guest at a wedding that I realized too late that I’m never going to look like any of the other guests no matter what I wear. I’ve been to more than one wedding where someone has commented on how “tan” I was in the middle of winter. I’ve worn a head scarf to weddings and gotten lost in the sea of sheitels and fancy hats. I’ve since learned that doing so was like announcing my status as a religious hippy, not the truth: that neither a sheitel nor a fancy hat would fit over my afro that day. And after receiving one wedding invitation, I remember crying at the bottom of my closet feeling intensely shallow for having nothing to wear, nothing in the right shade of appropriate black. It took several trips to Macy’s later and several boring black dresses before I realized I was never going to blend in. The more I tried to fit in, the more I didn’t. It took several Hispanic waiters at different weddings approaching me curiously to ask if I was also Hispanic for me to realize that I was never going to be cast in the part of nice, Ashkenazi Jewish white girl. I was going to be different no matter what. Wearing sneakers to shul didn’t make me different; it just meant that my only other option was orthopedic shoes. So now with many a faux pas under my belt where I felt like I fell splat on my face and unveiled my underwear to a vicious crowd, I am practicing just trying to be myself. But I still find myself frequently apologizing for things. I apologize for not knowing what to do and when. I apologize for not knowing what to say and how. I apologize for frequently “murdering” my husband, my friends and myself through an audacious level of embarrassing circumstance. After every excruciating social event, I go home and play them back in my head and try to make sense of it. 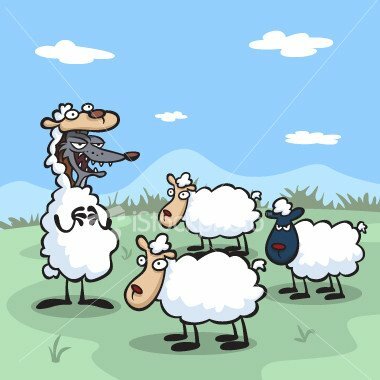 But even with all that effort, I still feel like a wolf trying to pretend to be sheep. This weekend I opened up my email to find that a friend was serving me an ultimatum. According to her, I had committed the ultimate crime in bad manners and no amount of apologizing was going to do the situation any amount of justice. I curled up into a little ball and cried for hours. My husband held me and tried to help me resolve how to fix the situation. But in the midst of all the pain, I realized it was futile. I realized that many friendships and “acquaintance-ships” can end over simple bad manners and mine just had. I came to terms with the fact that I might lose many friends this way and that being a convert will often be a path that I will travel quite alone. Next Post Oops, You’re Not Jewish! I got really sick at a meal at a friend’s house and I wasn’t the best guest. I apologized profusely and explained what and why I acted the way I did. But a year later, the friend, who I was mistaken had accepted my apology, decided to rehash things again. Don’t worry I’m starting to develop a thicker skin. Can I give you a hug, a mug of habichuelas con dulce, and a commiserating ear? I know it’s not always easy being a Jewtina in a world that operates on a series of norms that we just don’t get. Can’t help on the manners because I have no sense of personal space and frequently engage in what non latinos call TMI. I do, however, make some mean coquito and flan. I doubt you were as poor a guest as the out of town folks at my shul who tried to treat me like I was some kind poorly paid hired help; hell, at one point they said they needed to tell my boss to give me a raise, so I looked up to the ceiling, fixed my kippah and said “you heard that G-d?”. Cause, of course, everyone else helping out at the dinner was obviously a shul member, and for some odd reason, they kept thinking I was the only hired staff.Now THAT is a crappy guest. Now here is a nice cyber glass of coquito. Enjoy. I’m a light white girl and no one ever believes I am what I am.Jewish people think I look like “shikhsa.” Yes I’ve had it said that way. (It’s not my fault I’m way lighter than both my parents). The people in the American Indian Student Services office always give me looks when I come in to see my advisor. (My grandma is Cherokee and yet, I look whiter than white).I’m sorry you had to deal with such petty drama. When I was in high school, I always thought that sort of thing ended once people left high school and became adults. Another dream crushed. I really hate the word Shiksha. It’s offensive. I hate that people ever feel that it’s okay to use towards anyone ever. I’m sorry anyone said that to you Elisheva. As I’ve blogged before, it’s been misappropriated to mean ‘non-Jewess’ but it really means abomination. I challenge us all to bring that up the next time we hear it! During the “Pesach from Hell” it was one of many lectures I wound up delivering. No woman is an abomination. G-d did not create us as abominations. The rest of the meal was just as bad. Remind me to tell you sometime. Ah, racism in your own home. I’m sending you a virtual hug too. Hey, I know of one Shabbat where nothing went funny…when we came to you and your hubby’s in L.A. There were no oddities, no faux paus. Sometimes it’s just finding the shoe that fits. Being an observant Jew is easy if you fit the mold not just in looks but politically, socially, economically…more power to you, I would NEVER fit unless I did ortho the Sephardic way 🙂 Which by the way, you would fit perfect, but your husband would stand out 😉Be strong! I’ve actually made a turkey for the Shabbat of Channuka. Last night, in honor of this festive time, we dined on Indian style curry chicken. At Fortress Birchwood in Chicago experimentation, multi-culturalism, and Inna Garten have a lot to say about what gets fabricated in our kitchen. As for “La Jewminicana” being the worst Shabbat guest probably not. My wife’s great-aunt, who never fails to use a seudah to attack her 70 something daughter for being a “devil”, wins that award hands down.So if you come here someday we will treat you to a real Chicago classic: Chicken Vesuvio, invented in Windy City Italian restaurants and dined on by the finest mafia kingpins the Midwest has to offer. No, I can safely say I have never called a guest “a devil.” And I’m up for visiting the Mid-West sometime. omg….in the midst of my conversion i too had issues finding fashionable modest attire. so …i made it myself. ive always worn skirts (even before the conversion started) but i know how it feels.